It was a beautiful morning and we left Bazaruto early, straight after coffee, and arrived to anchor outside Vilanculos Beach Lodge in our old ‘parking bay’ (where the lexy episode happened). We had arranged with Phillip to fetch us and he was late. Nevertheless, time takes no precedence in places like these and he eventually arrived and we headed over to the airport to fetch Viki and Dylan. It was great to see her again and they were in high spirits ready to enjoy a sailing holiday. We stopped at the general store and bank to get more provisions and cash. Salad, bread, wine, eggs and milk were on my list. 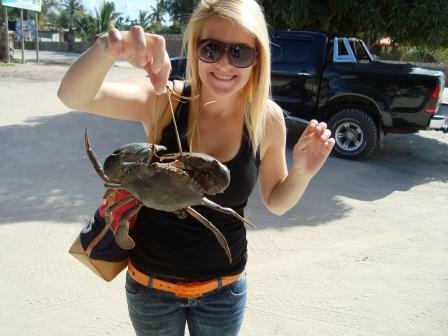 Kev purchased some fresh mud crabs and a box of frozen prawns. The store didn’t have any fresh salad, (again) but had recently stocked up on eggs and had fresh bread. Our visitor policy is, bring your own alcohol, so they (and we) purchased stock and then we returned to the lodge, where we had lunch on the lawn surrounded by our provisions. You can always spot a yachtie on the mainland by their ‘luggage’. The wind was picking up, and we headed to the beach, loaded everything into the bakkie, and set off to Catatude. She earned her name of bakkie, as she was loaded with 4 persons, Viki & Dylan’s luggage, case of coke, case of beers, savannas, our box of provisions, the bag with the fresh crabs and our prawns. We headed toward Catatude through the small choppy wavelets and reached the boat. Now, after my Lexy Lesson, I have learnt to stand up on a tender, balance, move one foot carefully forward towards the transom (the boats back platform), balance, then gentle place my foot on the transom, balance, then transfer half my weight onto my front foot (which is on the transom) balance, then gently but quickly transfer the rest of my weight onto Catatude. This procedure cannot be rushed because as you are balancing, a wavelet may be passing under the tender, and it may be that the tender is leaning to port (left)or starboard (right) or that the front of the tender is high on the crest or low in the trough. Generally all this happens in one balancing session. Very good for firm calves! As I was in the front of the tender (the section where you are most likely to get splashed) I stood up and started my balancing procedure. Something didn’t feel right and as I turned round to look at the tender I saw that Viki had also stood up and with our combined weight, and Dylan sitting on that side, we had pushed the tender down on the left, causing all the luggage, cases of coke, beer and Savannah to slide to our side. What a sight to behold, Viki and I hanging on to the stainless steel pole, our legs on the bakkie at 45 degrees pushing the tender into the water, water gushing in over the side, Kevin screaming at us to get off, luggage, dry bags and groceries, starting to float, and the tender sinking at a rapid rate. The engine spluttered and with a ’glug glug’ died. Dylan and Kev stared at us in disbelief, their eyes wide as saucers. Panic stations. At this stage Viki and I just abandoned ship and jumped onto the transom. We turned back to the face the bakkie, tied the tender to Catatude, and started grabbing whatever was passed to us by Kev and Dylan. It was mayhem. Did you know that eggs float? How embarrassing! Here are our guests, (who haven’t even been through the door), surrounded by a 2 meter radius of floating prawns, eggs, chocolates, loaves of bread, packets of peanuts, packets of crisps, long life milk cartons, bag of crabs, luggage, life jackets, dry bags, etc etc on an aluminium tender that was busy sinking! This was not a good start. Oh no, I thought, this can’t be happening. What a welcome to a sailing holiday, for poor Viki an Dylan. But, yes it was happening so out came the Superwoman strength and Viki and I worked furiously to haul whatever was within our reach out of the tender to lighten the weight so that she wouldn’t sink. It all happened so quickly and when we looked again she was about 20cm underwater (including the motor) with Kev and Dylan still sitting in her passing stuff to us. The boys actually floated out of the tender (ha-ha that was quite funny, but we dared not laugh at this stage) and as the weight became less, she surfaced. They baled the water out of the bakkie and got back onto Catatude via the swim step. Kev immediately got the outboard motor off and rinsed it with fresh water. Viki hosed down the cans and bottles with the freshwater transom shower. There was silence, then we all just burst out laughing. We just stood on the step, laughing and laughing. Kev being the ‘Mr Nice Guy’ that he is, apologised profusely and continually, for the untimely wet introduction to their holiday. I just couldn’t stop giggling. It was like a candid camera movie and for once I actually didn’t get wet. I glanced over to the lodge and after the lexy episode (this was on the exact same spot) was relieved to see that no one was watching. We all had a hot shower, dinner and went to bed. I would love to know what Dylan though of Viki’s loony family! If I was him I might have feigned a bout of seasickness just to end it sooner! After all the physical exercise of the previous day, we all slept late and woke up to overcast weather. 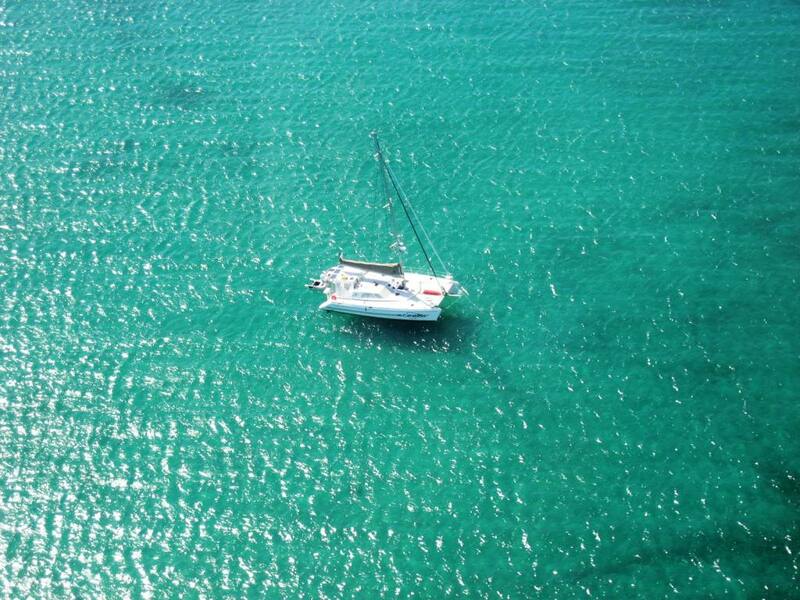 We headed back to Benguerra, put the mainsail up and had a very pleasant sail at 8 knots. We saw dolphin and large jellyfish on route. We anchored in our old place. The weather lifted at 11, the sun came out and the kids took Lexy to the beach to go and explore the area and tan on the beach. Kev in the meantime prepared a wonderful crab-curry for dinner, from the fresh mud crabs. As customary, we went to the Lodge for drinks at 16h00. We introduced Viki and Dylan to Robert and Phillipa of Yacht Salty Dog, Phillip of the Lodge as well as to ‘Coconut’ the Lodge Dog. Today was chill day, and we spent the morning in the sun on the trampoline, reading, swimming and generally lazing about. After lunch we went on a two hour Village tour which was very interesting and then, straight on to the Lodge for drinks at 16h00. We stayed a little longer than expected and when we decided to head on back to Catatude it was already dark. We had forgotten to switch our anchor light on and Kev who has a very mischievous side to him, instructed Dylan and Viki, who were in lexy, to head for the anchor light on the right. This was actually Yacht Salty Dog. He giggled all the way back, (yes, the bakkies motor survived, so hooray for Honda!) as he watched them go to the wrong yacht. We wondered when they would realize. We decided to go to Paradise Island (also called Santa Carolina), which is where the last South African TV series of survivor took place as it was highly recommended by the other yachties. 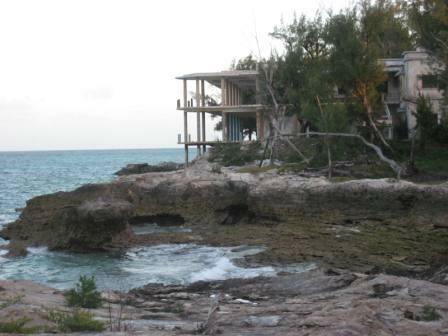 It is one of the five Islands in the Bazaruto Archipelago (Bazaruto, Benguerra, Magaruque, Santa Carolina and Bangue). Viki lifted our anchor and we navigated the channels carefully and after two hours arrived at the western side of the island where we anchored. It was a choppy anchorage as there was little protection from the wind. We tendered in, paid our World Wildlife Fund fee (WWF looks after the uninhabited Island) of M200 each, as well as M150 for the boat, and started to explore the Island. It has an old derelict, dilapidated hotel, a runway (still in excellent condition) and a small chapel. It was well worth the visit as it is in a beautiful setting with pristine white beaches, turquoise water and a hotel which had lots of rooms (every single one sea-facing). It must have been absolutely glorious in its day, and I’m assuming only for the wealthy. The survivor program, however, seemed such a farce as there are buildings all over the island, and you can’t really say it is very isolated! The producer of the series must have edited every shot to ensure there are no signs of habitation in any of the scenes. We even saw some chickens! We had a good evening laughing and chatting with some calamari and crayfish for dinner. 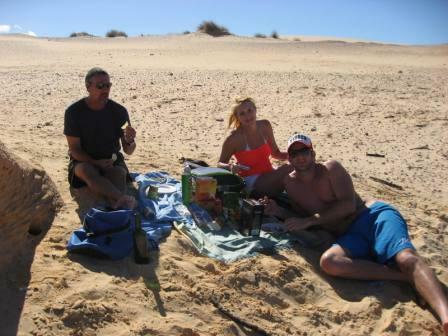 We left Paradise Island and headed for the southern tip of Bazaruto to climb the huge sand dunes and have a picnic lunch on the beach. Anchored with us there was also a dive boat with divers who had done their 1st dive at 2mile reef and were waiting to do their 2nd dive. 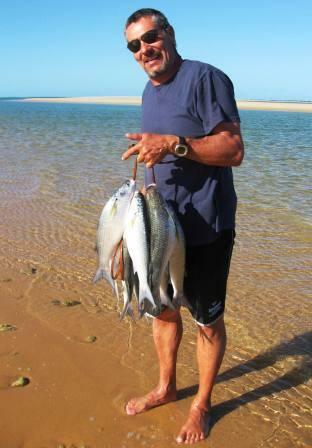 We had a wonderful lunch on the beach and purchased 8 fish for R50 from the local fishermen. We have yet to decide on what they are. Our WWF ticket from yesterday was still valid and as soon as you step onto the beach the WWF attendant is there to check your receipt. We returned to our anchorage at Benguerra (this is where most of the yachts anchor, as it is the most protected bay in the archipelago) and anchored in 4 meters of water. The weather was very hot and the water very clear and calm so Viki decided it was a good day to teach Dylan the basics of Scuba Diving. We have 4 sets of diving gear on the boat, as well as a diving compressor to fill the cylinders with air. 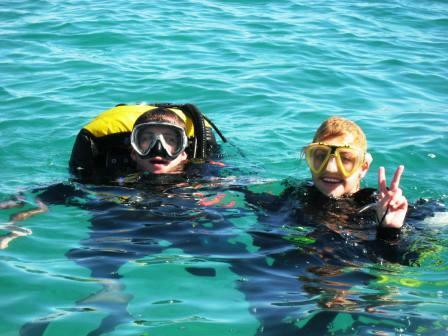 There is not much to see underwater as it is mostly sand, but they did the dive and he coped very well for a 1st timer. Viki also cleaned our ‘speed wheel’ for us (the contraption under the boat which tells you how fast the boat is going by turning in the water). Later on I also did a mini dive with Viki and did an inspection of the bottom of the boat, checking our anodes and forward looking sonar. Its wonderful to dive and then be able to get out and have a warm shower on the transom. We had three dolphin swimming on the sand spit about 30m from us. We wanted to swim with them but they were too fast. They must have been in about 1 meter of water as low tide had just finished. As Viki and Dylan were leaving today, and we were heading back to Joburg for 4 days to renew our Moz visas we prepared Catatude to be self sufficient whist we were away. Kev was a bit anxious about leaving her to her own devices, but we had asked Robert to keep an eye on her. Robert, collected us in his tender (thank goodness, I didn’t want things to end as they had started!) 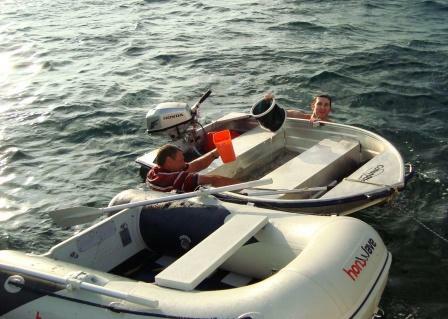 as we couldn’t leave our tender at the shore for 4 days (The outboard will be stolen). Phillip from the lodge, took us to the helipad where Chris was waiting for us. It was the most fantastic 10 minute flight over Catatude and on to the Vilanculos Airport. This area is absolutely beautiful. Immigration stamped us out of the country and we boarded our Fed-Air flight for Joburg and headed back to the ‘real world’. Time is passing by so quickly ! click for next newsletter . . . .